Donald Trump doesn’t have an immigration policy. Donald Trump Doesn’t Have an Immigration Policy. He Has Adjectives and Adverbs. Firm. Fair. Tremendous. Perhaps with a lot more energy. 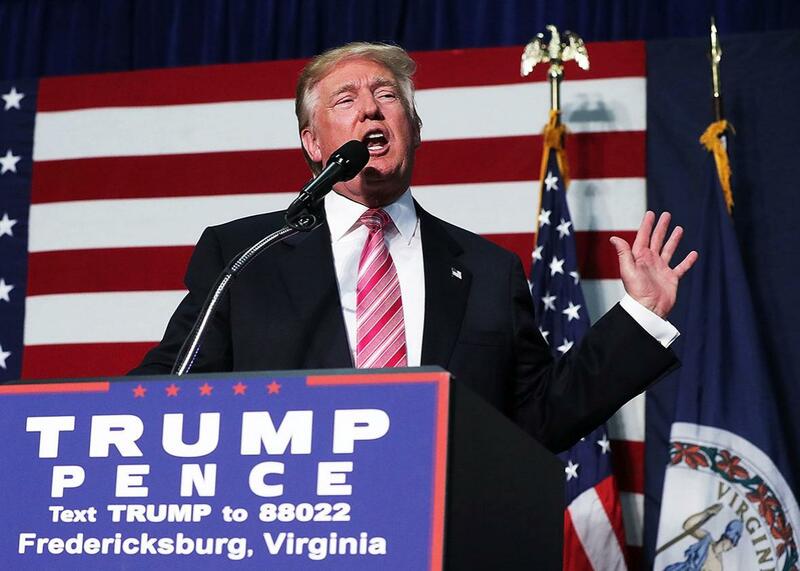 Donald Trump speaks during a campaign rally on Saturday in Fredericksburg, Virginia. It is more than a little funny to watch the political world try to suss out Donald Trump’s allegedly new immigration policy, as though there is, was, or ever will be such a thing. Trump is not familiar with immigration policy, because he’s not familiar with any policy. Building “the wall” is not a policy. It is a project. The wall is a wall. There are people who have written white papers for him. If he has read them, then I’m the Brookings Institution. Few ideas exist in his head, either. He doesn’t even have a whole lot of nouns at his disposal. His head is mostly descriptors, adverbs and adjectives, up to a second-grade level. Someone—an interviewer, a staffer—tees up a noun for him, he assigns descriptors to it, and then the poor pundits try to determine where his descriptions of nouns in the news land on the recognizable political spectrum. Some staffer gets to him and says, Hey, polls are bad. Time for a new adjective. The cycle repeats. Throughout all of this, 14 months and counting, the candidate has had absolutely no idea what he is talking about. This applies to foreign policy, immigration, tax cuts, nuclear weapons, Morning Joe, whatever. It’s quite something that Trump still believes he’s at war with the Post after an exceedingly generous framing like that. Maybe it was meant tongue-in-cheek. If so, bravo. Because the contrast here between buildup and payoff is hilarious. Trump spent “a few days” both “reflecting” and “consulting with Hispanic supporters” about supposed “immigration stances,” and after this scrupulous, comprehensive policy canvassing, finally “detailed”—this is the best word!—“how he would deal with the millions of immigrants illegally living in the United States.” This “detailed” plan is just maintaining the status quo (as he views it), “perhaps with a lot more energy.” His plan, as “detailed,” is an adverbial clause. If the intensive reflection, consultation, and analysis that took place before Trump’s O’Reilly interview achieved anything, it was to stretch existing adjectives and adverbs into these multiword descriptors. On Sunday morning, Trump’s new campaign manager, Kellyanne Conway, went on CNN’s State of the Union to clarify what he might have said or not said the previous day during a closed-door meeting with Hispanic supporters. “It’s that we need a, quote, fair and humane way of dealing with what is estimated to be about 11 million illegal immigrants in this country,” she said. Fair, humane. On Monday morning’s Fox and Friends, Trump described his plan thusly: “We want to come up with a really fair but firm answer. It has to be very firm. But we want to come up with something fair.” Really fair. Firm. Very firm. Also, too, fair. Donald Trump doesn’t know President Obama’s immigration policy—the things he is doing, the legislation he sought to pass, or the executive orders either in place or mothballed in federal court. He doesn’t know Obama’s immigration policy because he doesn’t know immigration policy, and he doesn’t know immigration policy because he doesn’t know policy. There are no “shifts” in policy, because there is no policy, and there are no details of something that doesn’t exist.